I am going to be getting a dog or puppy in the next 6months. I already have two children aged 3 and 18months, 2 cats, a rabbit and a hamster. I am at a loss as to what breed I should look to get. My other half thinks we should get either a border collie, a whippet/saluki/greyhound or a staff. I'm not very keen on short haired or stream-line dogs, I like dogs to have hair I can play with!! Obviously I need a kind of dog that's good with kids and I've heard staffs can be great protectors, I've also been told they'd eat my cats, which I don't want. I am an at home Mum who lives 5 mins from the beach, so this dog, whatever the breed, will get a lot of walks and love. I'd really like some advice as to what breed you think I should get. I've been looking on the net at rescue dogs as one option is to get a calm, submissive, middle aged dog from rescue and then when it's settled in look to getting a puppy as a companion, then the puppy can learn calm behavior from the older dog. How about a springer or cocker spaniel? Border collies are great but it can be a lot of work keeping them from getting bored as they're almost too clever for their own good They can also have a tendency to herd small children due to their working instincts. Spaniels are usually very gentle with kids, are are very affectionate and loving. My springer loves his walks and runs about like crazy, but is really calm and cuddly in the house. Rescuing an adult dog is a great idea, as it will have gotten over the over excited chewy puppy phase which can be hard with little kids around. I'd go for an adult dog from a shelter/rescue - pick carefully - ensure they are kid friendly. I dislike puppies with young children - you cannot guarantee a puppies personality when it's full grown - they require a lot of training & work, IMO. I wouldn't go for a Border Collie due to the herding instinct with kids. I've had "Pit bull" fosters who have done fine with my cats, other dogs, & been fine around kids.....so that is a possiblity. As for the slighter hounds - one fear of mine is the "breakability". I have little to no experience with them & young children, but generally the greyhound rescue I've spoken to requires older children. If you want hair - I'd lean towards perhaps an adult Cocker or Springer Spaniel. I've met some general Heinz 57 mutt dogs that are around 40-50 lbs with some hair that have been fantastic dogs that would be good choices. Your best bet would be to get a rescue dog from a foster situation, preferably one with cats and small children. That way, you will know exactly what you are getting on an individual dog basis rather than relying on breed characteristics. Good luck! I would rescue a dog in need and make sure it has been temperment tested well. It would be cheaper than buying from a breeder and often they have purebred, but any that loves kids and other small animals would be nice to check out. Otherwise, I advise if your going to be limited on time, Staff's require alot of exercise and really you do not need a protector as often they get too dominant over kids and will bite with mistake. Aussie dogs are great pets but require alot of exercise but likes thinks to do also. You have alot of nice pets it sounds like, so just get a friendly maybe 8 mo. old dog, do not choose one too old set in its ways to retrain it for your family of pets, etc. I wish you the best and hope you find a good dog. I have great Shepherds from Germany, but I helped make them just that way. They love people!! I am with craven, take a dog that IS in a foster home already, where you can see it with kids and cats. With the thought of that you have two young kids an older dog is likely better solution and then in a couple of years when the kids are older it would be easier with a pup into a fully established family and an older calmer dog. I have a rescue cocker spaniel and she's great with kids, before that I had a springer spaniel that my dad rescued when I was 10. He never left my side and was an absolute angel of a dog. 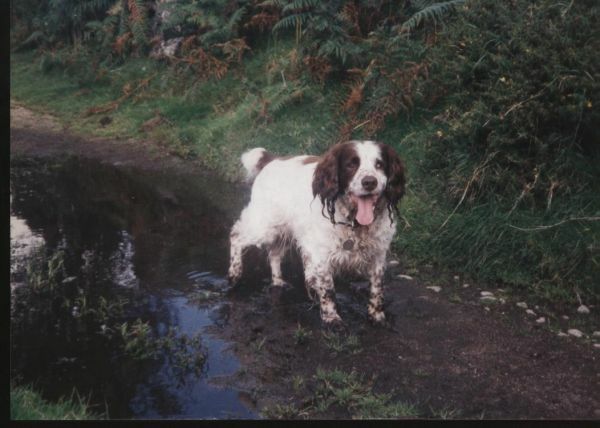 My brother was only a baby when we got Tizzy (the springer) and Tizzy was so tolerant of him, he never once snapped, growled or acted badly towards anyone. He could tolerate the accidental hair/ear pulling without protest, and that's what you want with a dog around kids. You did have to watch him with smaller furries though, he one got one of my hamsters - though luckily he didn't hurt it and just carried it around! Molly is the same (though a little more extrovert than Tizzy). In my opinion you cannot go wrong with a well chosen spaniel with kids as they are just soppy beyond belief. They have the right mix of cuddliness and playfulness and if you have a kid that will throw a ball, they'll love them forever. The others are right in that puppies are a lottery and very hard work, especially if you have kids. It's also not ideal to have puppy wee and poo around when there are kids wandering about. An older dog, whose personality has developed and is temperament tested, would be ideal. I also have a rough collie, mine is a bit loopy and not good with kids - but she has a terrible past so its not really her fault. My old rough collie before her was wonderful with children, and the really good collie lines are excellent with kids. After reading all your posts, I am very happy with the thought of getting a spaniel as they are one of my favorite dogs, however, my bf really like muscular, very large, working type dogs. Any ideas as to how I can change his mind? I always wanted a cocker spaniel when I was a little girl and I'd love it if he wanted one too, unfortunately I think he sees them as a very feminine dog and would feel silly walking it!! I know he's totally ridiculous with this claim as if he walked a gorgeous 8 months old cocker, he'd get chatted up all the time and he'd love it, lol! Any ideas?? My springer - he was VERY muscular and strong and quite big for his breed. The lines vary, I've seen others like Tizzy. He was very different to some of the smaller, working type ones, but not as skinny as the show types. Well maybe you could get a working type cocker if you have lots of time to exercise, you say you live near a beach, and you bf wants a working type dog and you want a cocker spaniel. Last edited by Chaz; 12-08-2008 at 08:17 AM..